Hiram select persons Harold Gillman and Joyce Siracuse welcome GrandyOats owners Aaron Anker and Nat Perice to their new 100 percent solar-powered facility in a former elementary school. GrandyOats moves from an old diary barn in Brownfield to a net-zero facility in Hiram. 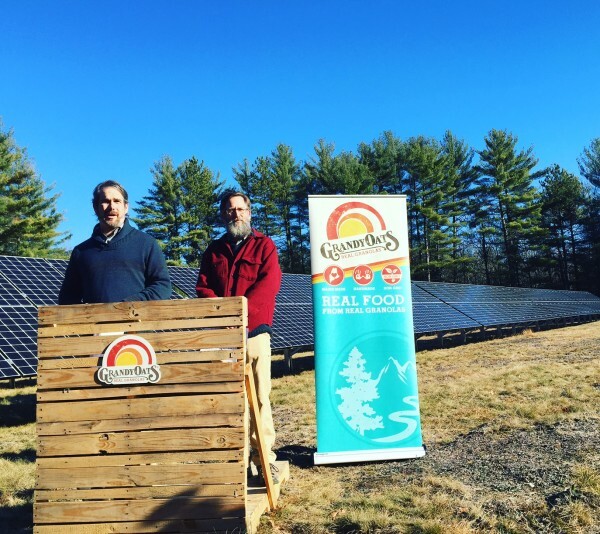 Two banks of solar panels will electrify their new headquarters in a former elementary school, making them the first 100 percent solar-powered food company in Maine. Aaron Anker and Nat Peirce, owners of GrandyOats, stand in front of 288 solar panels to announce their net-zero headquarters Tuesday. 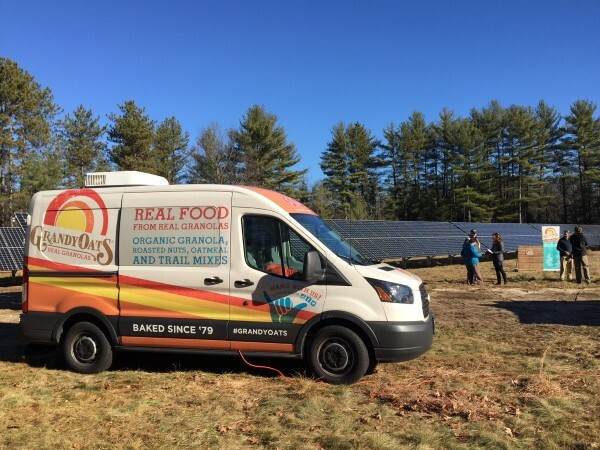 The granola and trail mix company opens in a former elementary school next month and will be the first 100 percent solar-powered food company in Maine. 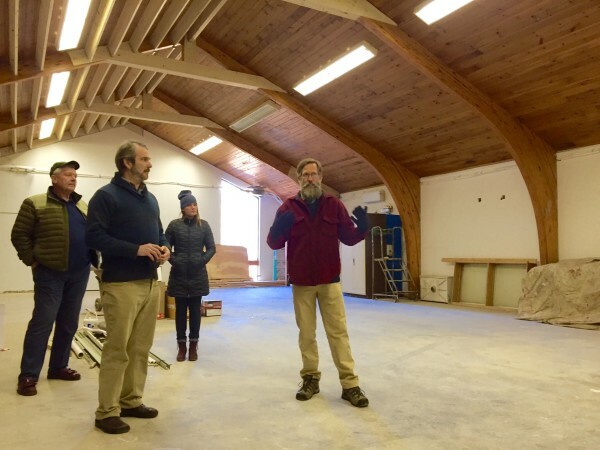 From left, Aaron Anker and Nat Peirce, owners of GrandyOats, give a tour of their new solar powered headquarters in a former elementary school in Hiram on Tuesday. “We thank the sun for being here today to help us fulfill our dreams,” said Nat Peirce, flanked by his business partner, Aaron Anker, and 288 panels positioned to leverage the power of the sun. The owners bought the school, abandoned in 2009, in the winter of 2014 to meet demand for their hand-made, organic products. Wanting to stay in the area where most of their 20 employees live, they set their sights on the available school on 8 acres along the Saco River. With natural light beaming down over former playing fields, their decade-long dream to go solar became feasible at last. 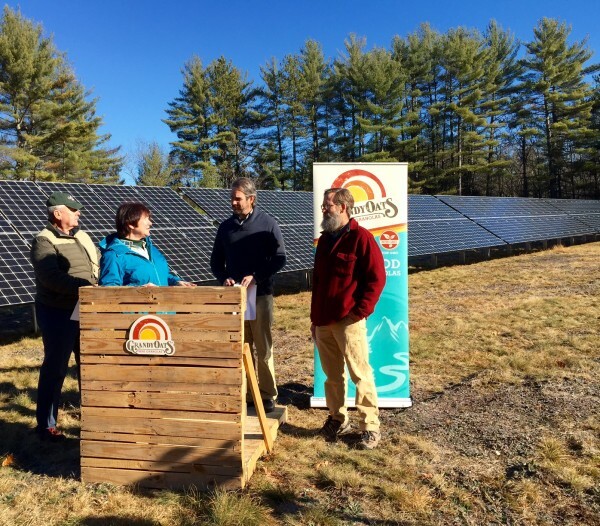 Although Maine doesn’t have endless, warm, sunny days, the state’s solar resource is one of the strongest in New England. “Usable solar energy here is comparable to Houston, Texas, and just 10 percent less than sunny Florida,” said Greenhalgh, who added that cold, sun-filled days generate more solar energy than hot ones. “This proves that you can do it in Maine,” he said. When the company creates more solar power than it needs, it accrues credit with the power company. So during snowy, dark days, GrandyOats will tap the grid just like anyone else, but its excess solar production is applied against the power it consumes. “Over the course of the year they will have produced 100 percent of their electric demand with the solar,” Greenhalgh said. The panels will generate enough electricity to produce 1.2 million pounds of granola and snacks annually. With a combined capacity of 80 kilowatts, every aspect of the facility, from electric ovens to heating and cooling, will be powered from the sun. GrandyOats, available in 40 states across the country, will have three times the space in its new facility and will be able to double its production. The company just entered the California market and announced a new line of gluten-free granola, which is expected to hit shelves in the second quarter of 2016. By putting the sun to work, GrandyOats hopes to be a model for other companies. When the company moves into the refurbished 12,620 foot space, complete with a gluten-free room and new warehouse constructed off the former school cafeteria, GrandyOats will be the largest employer in Hiram, a town of 1,600.